We offer specialised furniture delivery in London (and assembly) at excellent prices. It is available to both private and business customers. The service is quite flexible and can be customised as per individual customer requirements. We can pick up new furniture from point of purchase and deliver it to customer specified location at a prearranged time and day, if necessary new furniture pieces can be put in storage for the time being. We can relocate existing home or office furniture from one location to another, the later delivery option applies here too, and pieces can be put into storage until arrangements are made. Assembly – we are also able to assemble new furniture pieces upon delivery, or disassemble existing ones as to ensure quick and safe transportation from A to B. The assembly option is also available to private and business customers as standalone, and can be requested independently of any removal/delivery services we offer. The technicians we work with are qualified and experienced, they will take measures to prevent any damage to furniture or misplacement of pieces and parts. In many cases where we are dealing with existing furniture, our technicians will disassemble and pack pieces of parts separately in order to avoid damage. Of course in cases of antique or certain bespoke (custom made) furniture pieces, which cannot be taken apart, safe removal and delivery will be made possible through specific packing and securing procedures. When relocating or delivering large number of identical furniture setups (office cubicles for instance) our technicians will list and label (colour code) each set of furniture so we keep track of where everything is. Labelling, numbering or colour coding furniture sets also makes distribution by room or area easier and quicker. Our technicians and drivers are equipped with all the necessary tools and gear so there will be no chance of error or delays as far as pickup/delivery and assembly/disassembly is concerned. Our vehicle fleet is made up of specially equipped vans, fitted with all the necessary protective materials, packing and wrapping supplies, ropes and latching etc. 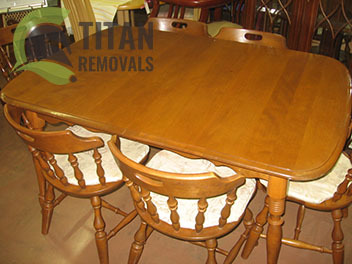 as to ensure damage-free transit of all furniture either assembled or in pieces. A certain number of our vehicles are also fitted with heavy duty tail lifts so that getting heavy or bulky furniture pieces on board safely and quickly is easy. Our London furniture delivery and/or assembly service are available for booking by private and business customers seven days a week, including public holidays, under flexible hours. We maintain good short notice availability, but nevertheless book your service with us as early as possible to avoid disappointment. The service is reasonably priced, and in our opinion delivers good value for money in all its variations. As all other moving services being offered by Titan Removals in London, our furniture delivery and assembly options come fully insured. We are certified in accordance to the CMR regulations, but be advised that our insurance options are just a safety net – we have zero percent accident ratio, mainly thanks to the great care demonstrated by the responsible members of our moving and delivery teams based and operating in Greater and Central London. Before the Roman conquest, and official forming of London (then Londinium) it seems the region was sparsely, if at all inhabited. However, there is geological evidence of many streams (now underground) and discovery of prehistoric artefacts, along with the possible origins of the settlement’s name suggest some Celtic tribe presence in scattered villages. Today London is a cultural, financial and political centre that can be compared with only the largest and most important cities in the world. Nearly fifty million people come to the capital on business or tourist trips every year. The City and Canary Wharf are where one will find all the big financial institutions. Famous landmarks include London Bridge, Westminster Abbey, Tate Modern, the Eye and many others. Those have become icons and symbols of London with no rivals.